Just a few days away from opening! 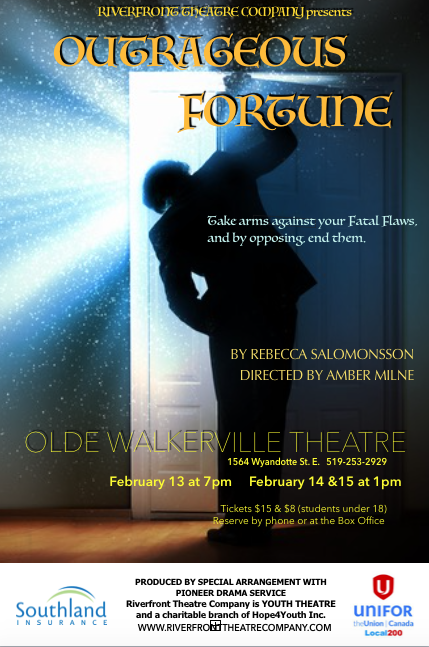 Today, Riverfront Theatre Company moves into our new performance home, The Olde Walkerville Theatre, for the first time. Outrageous Fortune is set to open to school audiences on Friday morning, and to the public on Friday evening. We have three public shows – Friday evening at 7, and Saturday and Sunday matinees, both at 1 p.m.
We look forward to having you join us as we share the laugh-along story of a group of Shakespearean characters in group therapy! If you’re new to Shakespeare, this is a great introduction. If you’re familiar with Shakespeare, this is a great opportunity to revisit some of his most popular plays and get some “inside information” about how his characters might wish things to have gone! Tickets, $15 for adults, $8 for students under 18, available at the door or through the box office (see poster!). Previous: Previous post: Please Join Us for Breakfast! Next: Next post: Outrageous Fortune has ended! What’s happening NEXT?